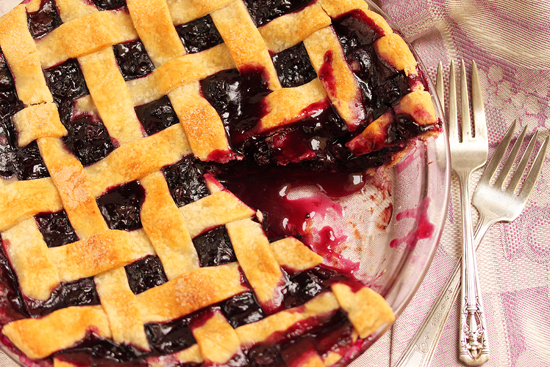 For me, July 4th is not the Fourth of July without Blueberries. I said it last year when I gave you my Blueberry Pudding Cake, and I’m saying it again this year. As we celebrate our major grilling holiday, what could top off that barbeque feast more lavishly than Blueberry Pie with Vanilla Ice Cream. All that sweet berry goodness, buttery crust and vanilla creamy-ness. Oh yeah. The pie dough is divided in two, half formed into a disk, half into a rectangle, and chilled until firm. The rectangular half is rolled out to 9 ½ x14 ½ inches. The dough is marked along the edge at ¾-inch intervals, then cut into 12 strips. Six strips are placed horizontally on a cookie sheet and alternating strips are folded back. One strip is placed vertically left of center, with the dough wetted with a finger where they cross. The disk of dough is rolled out, rolled over the rolling pin, centered in the pie plate and the blueberry filling is added. The parchment paper is removed from the chilled lattice and turned over onto the pie filling. It is one solid piece so can be pushed to center on the pie. The top and bottom edges are pressed together, cut to a ¾-inch overhang, and folded under to make the rim on the pie plate edge. It is brushed with cream and sprinkled with sugar, ready to pop into the oven. 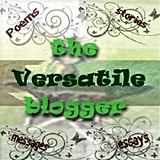 I hope your Fourth of July had great weather, convivial companions, delicious BBQ and Blueberries! 1. Sift flour and salt into a bowl. Cut in butter with pastry cutter or two knives until mixture resembles bread crumbs. Stir in sugar. 2. Mix egg yolk and water together in a small bowl. Add to butter/four mixture, mix until homogenous and grains of flour mixture have disappeared. Form into a ball with your hands in the bowl. 3. Divide dough in half. Shape one piece into a disk ¾-inch thick and the other into a 4×6-inch rectangle. Wrap each tightly in plastic wrap and rest in the refrigerator until firm, 30 minutes to 2 hours, and up to 2 days. (Or freeze for up to one month.). 1. Remove rectangle of dough from refrigerator and let sit until pliable, about 10 minutes. Remove disk of dough and let sit at room temperature while you make the lattice. 2.On lightly floured parchment or pastry cloth, roll dough with floured rolling pin into 9 ½ x 14 ½-inch rectangle, about 1/8th inch thick. Roll from center of dough to edges with as few passes as possible, running an offset spatula or bench knife under dough to be sure it isn’t sticking, giving the dough a quarter turn. Re-flour parchment or cloth and rolling pin only as needed, as excess flour can make crust tough. 3. 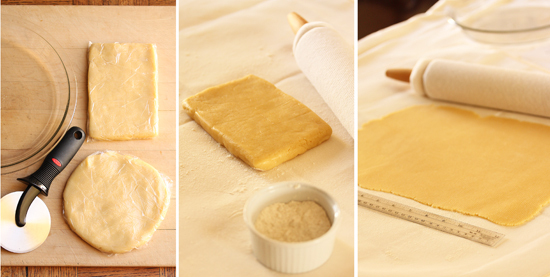 With fluted pastry wheel or chef’s knife, trim dough into a 9×14-inch rectangle. Using a ruler, mark dough at ¾-inch intervals. With wheel or knife, cut 12 strips of dough that are 14-inches long and ¾-inch wide. If dough becomes too soft to work with, chill on cookie sheet until firm. 4. Line a cookie sheet with parchment. Arrange 6 strips of dough horizontally ¾-inch apart. These will be the bottom strips. 5. Fold back every other bottom strip to the left slightly more than halfway. Slightly left of center, lay down one “top” strip vertically over bottom strips, dabbing bottom strips with a wet finger where top strip overlaps them. Dab the top strip where the folded strips will overlap it, then unfold the strips, pressing down where strips cross. 6. Fold back the other 3 bottom strips to the left. Lay a second top strip ¾ inch to right of the first, dabbing with water as before. These are the two center strips. Unfold the bottom strips. Repeat process on both sides with remaining top strips of dough, sealing with water where strips cross. 7. Press gently where strips overlap to seal. Cover loosely with plastic wrap and refrigerate on cookie sheet until firm while you roll out bottom crust and make the filling. 8. Position rack in center of oven and set a foil-lined heavy-duty rimmed baking sheet on rack. Heat oven to 425 degrees F.
1. On lightly floured parchment or pastry cloth, roll disk of dough into a 14 ½-inch circle about 1/8-inch thick. 2. Roll the dough around the rolling pin and position over a 9-inch glass pie plate. Unroll onto plate, gently pressing dough against bottom and sides. Allow excess dough to hang over edges. Let sit while making the filling. 1. In a large bowl, mix together sugar, flour, lemon zest and juice, and salt. 2. Add 1 cup blueberries and crush them into the dry ingredients with a fork or potato masher to make a paste. 3. Add rest of berries and toss to coat. Scrape filling into crust with rubber spatula and spread evenly. 1. Remove lattice from refrigerator. Holding the lattice on your palm and spread fingers of one hand, parchment paper side up, peel parchment paper from bottom and turn lattice over onto pie. 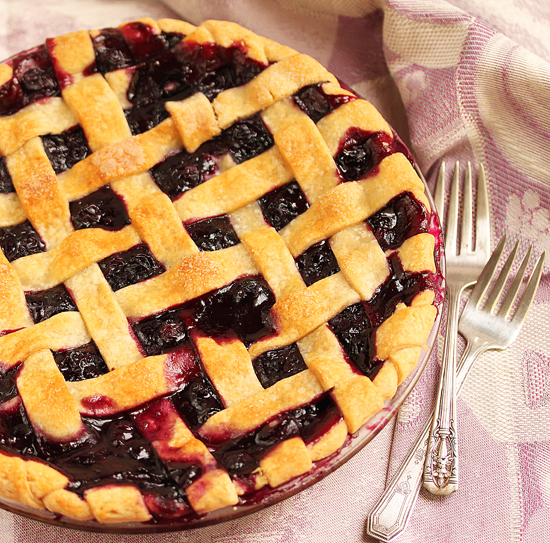 Lattice is one solid piece, so push it until it is centered on pie. Allow to sit at room temperature for a few minutes until pliable. 2. Press lattice and bottom edges together and trim both crusts to ¾-inch overhang. Roll the overhang under to form an edge that rests on rim of pie plate. 3. 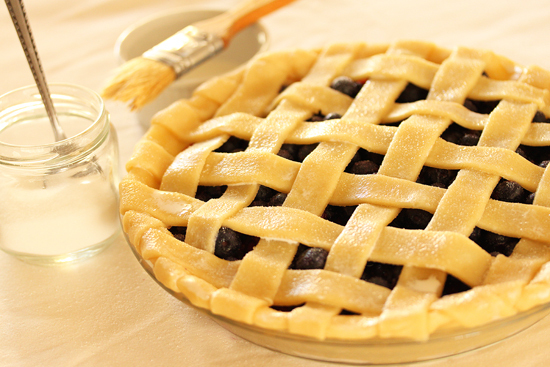 With a small pastry brush, brush egg or cream over lattice and edge. Sprinkle generously with sugar. 4. In preheated 425 degree F oven, put pie on heated baking sheet and reduce oven temperature to 375 degrees F. Bake until edges are pale golden, about 30 minutes, then cover edges with foil and continue to bake until lattice is golden-brown and filling is bubbling about 2-inches from the center, 80-90 minutes total. If the lattice is golden-brown before filling is bubbling, cover it loosely with foil. 5. Cool pie on rack to room temperature, about 3 hours, before serving. Can be made 1 day ahead and stored, covered when cool, at room temperature. Refrigerate for up to 5 days. Wow, simply stunning! I’ve made lattice crusts before, but they were very half-assed. Now I know how to make them whole-assed! Of course I’m in agreement with your pate sucree credo. F*** dat hydrogenated oil! Your pie rocks! I agree… shortening should be banned. Your precision and attention to detail is astonishing. I have an idea: Come over to my house and teach me how to make this pie? And we make homemade vanilla bean ice cream, too (using eggs from my backyard). And then we eat everything together?